I had been growing tired of the ride leadership gig for a while and had convinced myself to "lead" this ride since Bill P of Laugher fame would also be leading and I could dole out most of the responsibility to him. Well, I arrived at the Fauntleroy Ferry dock under false pretenses; Bill was doped up on some performance-lowering meds (silly man) and was looking to me for leadership and someone had to tell this crowd of brightly colored wheel-powered people where to go. The first step after disembarking the ferry at Southworth was to shed the speed demons. To accomplish this, I dawdled on the first hill and soon the Rabbits charged off the front. I had told Bill that I would set off at a nice, moderate pace so as not to blow him off the back. Well, I guess I lied. I was chasing the Rabbits like a greyhound, ascending, descending, leaning left and right, turning at a high rate of speed. At least I remembered to leave a corner person here and there. I even had the nerve to take the enlarged group down a hidden driveway that Greg Sneed had introduced me to, with gravel spewing, pedestrians cursing, babies crying and cats screeching until we popped out on a quiet lane by the sea. In no time, we were tearing through the farmers market in Port Orchard (more cursing) to the restrooms. Did we arrive with everyone, I wondered? Well, here comes Tom Tanner down the steps from the road and there I see Dan D has straggled in, as well as Big Dan, with a smile on his face. Good enough for me. Upon leaving, I found myself on the wheel of a fast guy (Peg's friend Bill) and not only was he a fast guy, it turned out, but also a guy unfazed by 60mph traffic whizzing by...on our right. We had merged onto the highway into the left lane and, since we were going to exit left , we stayed there for what ended up being a 1/2 mile. In a car, that's all of 30 seconds but on a bike going 20mph behind a fast guy, well, you do the math; it's too traumatic to actually put it in writing. We made it to the exit with everybody intact, as far as I could tell. Maybe a few frazzled nerves but we cyclists are kind of used to that. The fast people then looked to me and said, "where to?". Oh no, they need a leader while I all I wanted to do was ride without having to think and now we were getting into some serious hills. I dropped a corner here, regrouped there and it seemed like we were all together. Our Big Guy was hanging on so, with him as my indicator, I continued on. 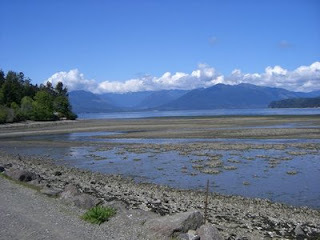 After more climbing came a glorious descent to the Seabeck area and views of water and the Olympic Mountains. 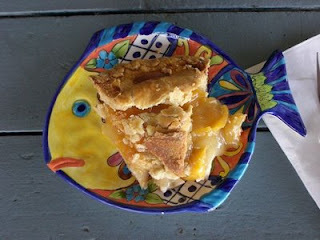 We rolled into Seabeck where the pie-eating was already in progress; I learned that this year, even some Rabbits stopped long enough to have pie. They are getting smarter. Once we were back on the road heading south, it became clear that there were two groups within our large mass. Peg, with cue sheet in pocket, had taken a faster group ahead and that left me with Bill P, Kent, Steve R, Steve H, Emily, Elizabeth, Lloyd and big guy Dan. A few others had actual lives to tend to in the city and took a shortcut back. My group was mostly full of people I had ridden with in the past and the new people were a welcome addition. Through a great twist of COGS/Laugher fate, we ended up with a cheering squad while heading up the steep climb out of Holly. Yes, we basically had a red carpet rolled out for us. Spritzes of rose-scented water, cups of hydrating liquids, the roar of our fans- well, something like that. Soon enough, though, we were on the ridge and looking down to Hood Canal and the Olympics. More climbing, descending and laughing and enjoying were to follow, since there were few cars and the road seemed like it was made for us. Our bicycling bliss ended as we descended down to the road to Belfair and eventually made it to the Highway of Hell. We took Hwy 3 out of Belfair, up a long hill and to the backroads of Pt Orchard as a way to avoid another leap across three lanes of 60mph traffic. Not bad, but far from bliss as there was a lot of traffic on Lake Flora Rd but the shoulder was gravel. But much better than the suicide ride on the hwy that we made last year. 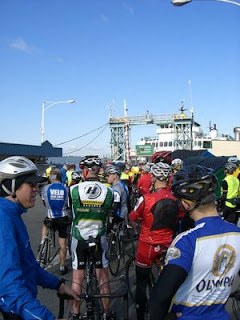 We gathered everyone up before the descent to Port Orchard and pacelined toward Southworth. It was at that point that I realized how tired I was. This was the longest ride of the season so far and with twice as much climbing as my last long ride (see MayDay Metric post). So when Bill's rear tire was looking flat, I rejoiced at the thought of stopping and getting off my bike. Of course, I let him think I was just a caring friend, being supportive of his mechanical needs. Five of us stopped, the other half continuing toward the ferry. 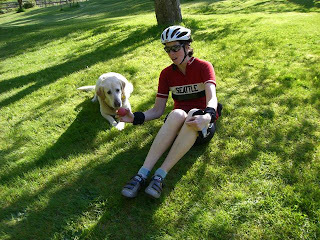 We had chosen a driveway with a lot of grass and an orchard and, as we settled to the task, saw that it came with a dog, too. At first bark, the dog seemed defensive but I could see he was wagging his tail and knew he was happy to see us. He came in close range, then pulled away and returned with a ball. We all had our jobs: Bill and Kent went about fixing the flat, Steve R snoozed, Elizabeth stretched and I played fetch with our new friend. We were sorry to leave when the time came but we eventually headed back to the ferry where we had missed the boat and had 1.5 hours until the next one. While normally I like to have a juicy steak after a ride like that one, my choices were limited to the corner store and so I suddenly became a calorie-craved, non-discerning eater of interesting combinations. Chocolate milk and beef jerky? Sounds good. Strawberry-Banana smoothie with a Snickers bar? Delicious! And don't forget the Oreos; they go with everything. I even saved a few for my ride buddies while we embarked the ferry, crossing the south sound in dwindling light. Off the ferry, we rejoiced that we had just one last hill to climb before regaining the parking lot and our awaiting cars. A great ride, beautiful day and excellent cycling companions. For more photos, see here. And the (corrected) ride route here.